I’m here to tell you a little bit about our living trash can with crazy eyes and an annoying bleet. If you know anything about Seinfeld…he’s the Newman of the Raising Up Rentfros show. When Neil brought him home (unexpectedly…ahem), I was in love with this squat-bottom beast. He was adorable. He even rode in the cab of Neil’s dirty old red pick up truck with him and came with a collar. Neil got him to hop out and attached the leash and that was pretty much it for me. A devilishly rugged and handsome Brawny man walking a teeny goat on a leash. OK! Sign me up!! Immediately I went into full “mommy” voice…you know, with the “goos” and the “gahs” and the “coos”, etc. He was just so darn cute! Hi, Hi, Hi, Howdy, Hiya, Hey There, Hi…..Oh!! Hey. Have you ever had that one (ex) boyfriend that you’re like…”Man, he’s SO good looking! If only he wouldn’t talk”? Yeah well, he’s kinda like that. So demanding too! We already have a toddler! Neil had the cheek to suggest he stay inside with us in the house (that we rent, mind you) because he “clearly is a lap goat” and needs to be another house pet. We already have three dogs inside…no. To be honest, I really did love the idea in theory like maybe if we had no dogs and if Kaya were older, but finally we both realized that Manny was going to need backup with protecting the chickens outside from whatever lurks in the woods surrounding us. It was the best place for Gotyer. Don’t feel bad for him though guys. 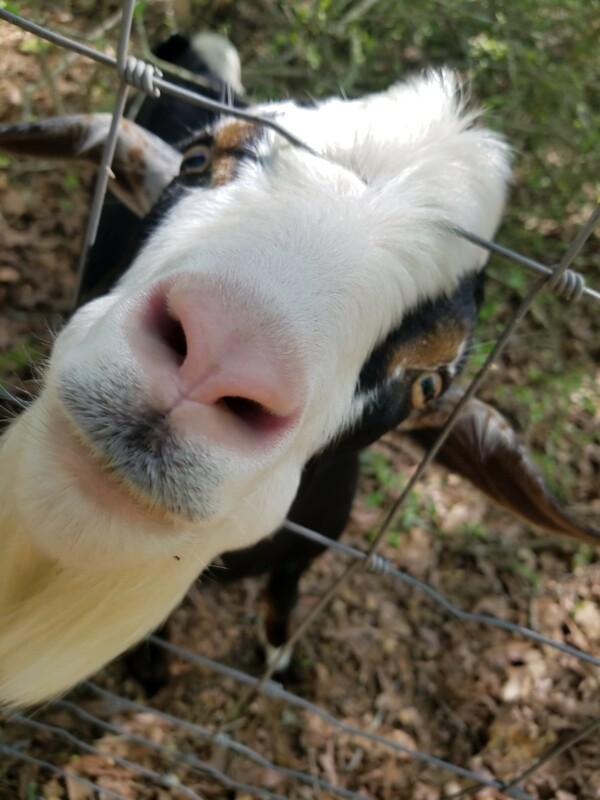 Gotyer spends his days climbing trees, eating Yaupon/clearing land with Manny, eating kitchen scraps and giving Kaya goat kisses. I’m sure he also does his fair share of predator “A” kicking after hours…at least that’s how I imagine it. I guess he’s not terrible terrible and his persistent bleet does drive me absolutely bonkers. But, in the end…he’s a big-hearted, bottomless-stomached, sassy ball of fur in a little package and he loves us. So… I guess he can stay. Do you have any weird furbabies living with you? Dogs, Cats, Fish, Goats, whatever! I want to hear about them! Next Post Try Brisket Nachos on Leftover Night!